On July 11, 2015, I learned to fly. Granted, I flew for only about seven minutes before coming down for a not-so-elegant landing, and I spent most of those minutes confused about what to do with my hands. (Note: This is a very legitimate problem that seems like a no-brainer until you’re in the air. EVERYTHING SEEMS AWKWARD so naturally I ended up flailing around like a crazy person the whole way down. So much for upping my cool factor.) Despite my failed attempt at gracefulness, skydiving remains one of the most surreal and liberating experiences of my life thus far. If you had asked me at this time last year whether I would consider jumping 14,000 feet out of a plane, I would have laughed at you. Frankly, I might have given you the same answer even just last month. I have never been an adrenaline junkie, and as a young child I was convinced I faced imminent death every time I stepped into an airplane. My adventurous parents used to joke about my picky eating habits and lack of courage to do most anything outside of my comfort zone. I was queen of the safe, hesitant, and familiar, happy to stick within my own little bubble but apprehensive to take even the tiniest step out. The path of least resistance still leads somewhere, right? WOW, was I missing out! I have learned a powerful lesson these past few years about the joy, fear, and exceptional growth that come from living a life that is wildly uncomfortable and uncertain. The most defining experiences in our lives do not come at moments when we order buttered noodles instead of pesto sauce or choose to stay in a bad relationship rather than break free of it. We are most deeply affected when we break the mold, jumping headfirst into the unknown without keeping a running list of every possible wrong scenario. There are about a MILLION potential wrong scenarios at this particular moment. Believe me, I had considered them. Yet here I was. I knew that for my birthday this year I wanted to give myself something a little out of the ordinary. 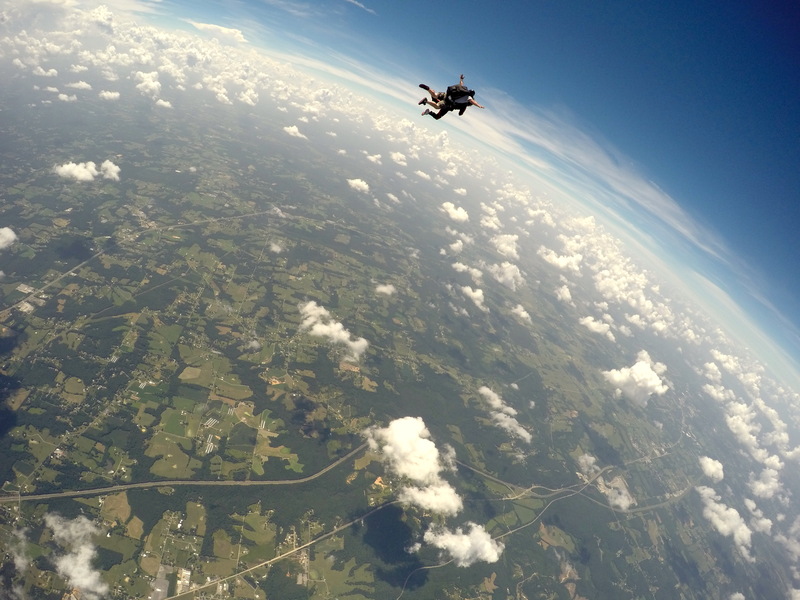 Like most things for me, skydiving wasn’t solely about the experience of jumping out of a plane- it represented a larger metaphor for the type of life I want to lead, one that marches headfirst into uncharted territory without letting excuses get in the way. I’ve always looked at skydivers and thought “I could NEVER do that.” But here’s the catch: What if I could? It’s easy to talk ourselves out of things and far too difficult to take the leap and commit to them. So in early June I decided, much to my own apprehension and my family’s surprise, to do something I never thought I could. 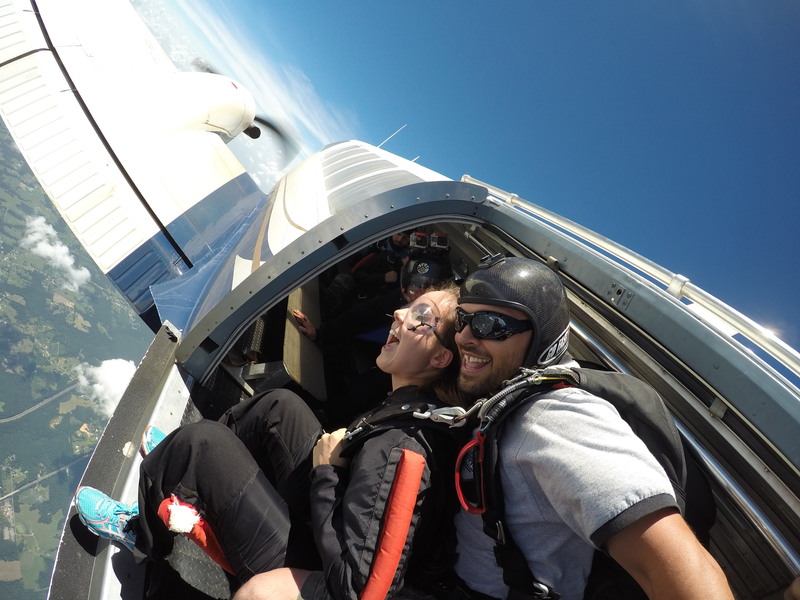 It didn’t surprise me when my best friend Danielle jumped immediately on board. If there is one thing I admire about Danielle (and actually there are about ten million things), it is her spontaneity and willingness to do almost any anything that involves adventure. She has taught me volumes about being fully present rather than living life like a to-do list, which is a trap I tend to fall into when schedules get busy. (She also promises me that it’s okay to be late sometimes and that traffic is a good thing because it allows more time for conversation.) Danielle is a shining example of God’s tendency to place specific people in our lives exactly when we don’t realize we most need them. She is a blessing far greater than I’m able to sum up on this page. Should I just turn this into a Danielle Isbell appreciation post? Probably. Here’s the thing about experiences that scare us: they make life infinitely richer because they teach us we are capable of far more than we give ourselves credit. Whether it’s something as major as skydiving or as minor as changing up your order at Chipotle (kidding, that’s a HUGE deal), do something today that makes you uncomfortable. Life will be that much fuller because you took the leap. YOU, who didn’t even want to drive a car??!! And I’m SO glad to see you FINALLY proudly toting that AWESOME middle name Sarah Abbott Ellis!! Wow. crying. i love you so much.